Hope is not only a good thing, as Andy Dufresne says in The Shawshank Redemption, but it’s also a small town of about 10,000 people in Southwest Arkansas, about 30 miles northeast of Texarkana. Oh, and it’s also the hometown of one president, Bill Clinton, and another who aspires (Hopes?) to also win the office, Mike Huckabee. Emphasizing modest, small-town roots is common for presidential candidates as a way of showing voters that they are one of them (even if they are not). In the case of Clinton and Huckabee — who truly did come from humble origins — the use of a town called “Hope” in sloganeering proved irresistible. “The Man from Hope” was the name of a Clinton campaign video shown at the 1992 Democratic convention, and Huckabee’s slogan for his second campaign, From Hope to Higher Ground, is also — conveniently — the title of his 2007 book. While name-dropping a hometown isn’t exclusively reserved for those with humble origins, it’s a trick that those who came from obvious wealth can’t pull off. For instance, John F. Kennedy couldn’t credibly pretend his roots in Brookline, MA, were humble, nor could Mitt Romney cite a small town in Michigan as his place of origin (he was the son of a future governor born in Detroit, a fact that didn’t help him much in his native state in 2012). Other wealthy candidates have become associated with places where they go to rest. Franklin Roosevelt and Warm Springs, GA is a perfect example. FDR went there to cope with his polio, and he also cited the town to show his connection to the South — a region he uniformly carried in all four of his election wins. The Bush presidents, neither of whom were born in Texas (George H.W. was born in Massachusetts and George W. in Connecticut) are perhaps best associated with retreats in small towns: The senior Bush would relax at the family compound in Kennebunkport, ME, and the junior Bush cleared brush at his Crawford, TX, ranch. Hope’s unique place — we can’t think of another tiny town that has produced two legitimate presidential candidates in modern politics — got us thinking about other small towns that have been elevated to prominence through their association with national candidates. But instead of just listing these places, we thought we’d test your knowledge instead. 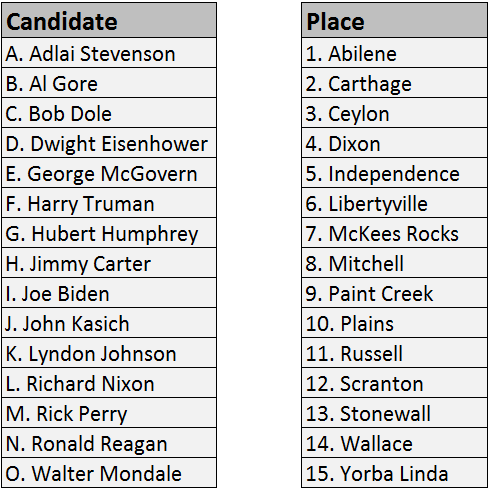 Column A lists former presidents, presidential nominees, and a few potential 2016 aspirants who cite their hometowns, while column B lists certain places where these candidates are from or are otherwise associated. See how many towns you can match with the correct candidates. To make it more challenging, we’ve omitted the states where the towns are located. It’s worth noting that not every town listed is where the president or candidate was actually born. After you’ve completed the quiz, check out the answers.